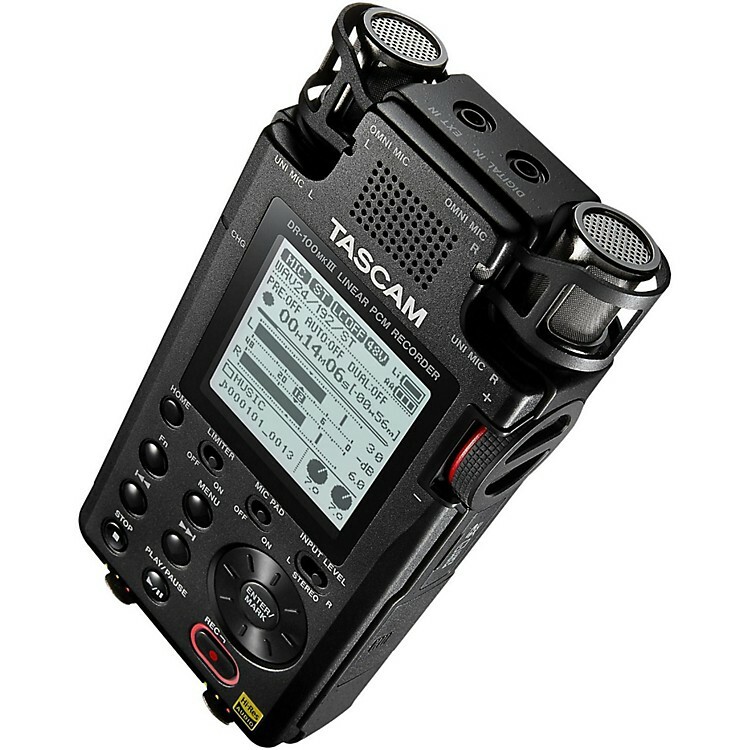 Tascam's top-line digital field recorder's latest revision. The DR-100mkIII features dual AKM AK4558 converters with VELVET SOUND architecture, providing both high sound quality and low power consumption, achieving a signal-to-noise ratio of 102dB. By eliminating interference between left and right channels, signal-to-noise ratio is maximized and audio fidelity is improved. In addition, each of those AD converters can work in a Dual ADC mode. The two AD converters work in tandem then combine their results for a 109dB S/N ratio, beating the (already excellent) 102dB S/N ratio achieved when recording in standard mode. The precision of the built-in clock is crucial when digital recordings made on what device are to be used in conjunction with materials recorded on other devices, such as when combining digital audio and video assets. To ensure stability, the DR-100mkIII utilizes the same Temperature-Compensated Crystal Oscillator (TCXO) used in professional studio master recorders. Moreover, the TCXO is not affected by the temperature of the environment, critical for a portable device which must maintain its precision in support of high-quality recording. The user interface has been designed to maximize visual confirmation, and includes a large LCD screen (double the size of the screen on the DR-100mkII), dedicated status LEDs for features such as record levels and status and easy-to-read legends on the casework. Dedicated hardware controls have been implemented for the most commonly accessed features to enable quick, positive operation in the field. The best field recorder. From recording babbling brooks to chamber music in a hall, this is the one.